Comments: Maude Abigail Parker (Nee: Bacon) | Tuscola IL United States | 1961-1965 | Comments: Cecil Vernon Parker with second wife Maude Abigail Bacon Parker. 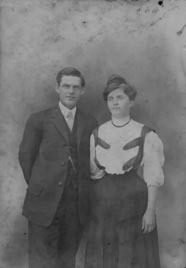 Married Dec. 25, 1907. Maude was born January 4, 1885 near Glasgow, Kentucky. She was the daughter of Charles Smith Bacon (the photographer) and Lucinda Burgess McGlocklin.